I know that the rules state that one can capture en passant only on the first opportunity, but it is not entirely clear how "opportunity" is defined in the rules. Suppose Black moves a pawn two squares in order to move next to a white pawn on the 5th rank, simultaneously discovering check on White's king by a black piece. 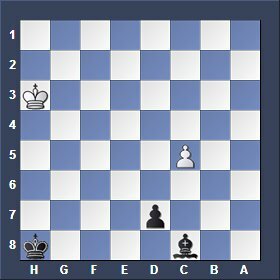 The en passant capture is illegal due to the fact that it would leave White's king in check. (Example: a white pawn is on c5, a black pawn moves d7-d5, a Black bishop is on c8, and a white king is on h3) See position below. Does White *ever* have the opportunity to make that particular en passant capture? In other words, can White make that en passant capture later on, as soon as that capture no longer puts or leaves White's king in check (provided that the pawns are still next to each other on the 5th rank)? you are right, the en-passant-capture would be illegal in this case (after 1...d5+) because White's king must move away from the check. After White has moved his king he has no right to make the en-passant-capture later on because this would be against the rules. So he will never ever be able to make the en passant move in the future. While playing chess always be aware of en passant moves. So White never gets to make that en passant capture! I later on tested this using the endgame database set-up mode in Shredder, confirming this ruling.